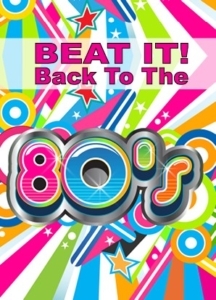 Remember the 80’s? Of course you do! We’re going to revisit that totally radical, non-stop fun-loving decade. Find your bell bottoms, relax and enjoy a fun afternoon for the young at heart under the disco ball. Before the show, we’ll stop for lunch at O’Donoghues Irish Pub for a buffet lunch featuring house salad, fruit, chicken sandwiches, hamburgers and fixings, chips and dip, cookies, bars and coffee. Sounds like a totally great afternoon! 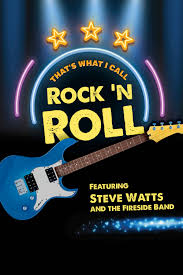 A brand new, live musical celebration featuring the wildly popular Fireside Band led by Fireside favorite Steve Watts! Also featuring a cast of talented singers, this show is the ultimate rock and roll party with music of the 50’s, 60’s, 70’s, and 80’s! They’ll be paying tribute to some of the biggest rock superstars of all time such as Elvis Presley, Jerry Lee Lewis, The Beach Boys, The Beatles, Jefferson Airplane, Dusty Springfield, Stevie Wonder, Earth, Wind, and Fire, Michael Jackson, Prince, Led Zeppelin, Billy Joel, Van Halen, Queen, Bruce Springsteen, and many more! This is an unforgettable show of rock and roll like no other. Your lunch includes chopped chef salad, freshly baked breads, chicken bruschetta served with tri-colored Couscous, quinoa, black beans, corn, fresh asparagus and carrots. Top it off with Key Lime pie, coffee, tea and milk. Did you know White Pines have a Chicken Ranch in it? Lord, have mercy on our souls! 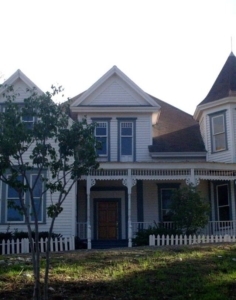 Miss Mona runs the Chicken Ranch, a brothel with a long and colorful history. The locals have a good relationship with the institution, and Mona is respected in the community. The sheriff, Ed Earl Dodd looks out for the Chicken Ranch due to his past with Miss Mona. When pious reporter Melvin Thorp exposes the brothel, outside interests want to shut it down, putting the governor in a tough spot. A must see on your calendar and good wholesome fun! A wonderfully, delicious buffet lunch is included with this fun afternoon. Before the Beatles and the Rolling Stones ever played a note, popular music was forever changed by a bespectacled kid from Lubbock, Texas – Buddy Holly! Now you can witness his story explode onto the Fireside stage in a toe-tapping, hand-clapping extravaganza, which will have you up and dancing. 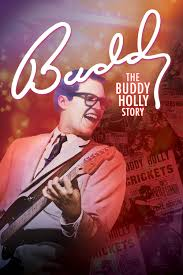 Buddy tells the true story of Buddy Holly through his short, yet spectacular career, and features the classic songs, “That’ll Be the Day,” “Peggy Sue,” “Oh Boy,” “Everyday,” “Not Fade Away,” “Heartbeat,” “Rave On,” as well as The Big Bopper’s “Chantilly Lace,” Ritchie Valens’ “La Bamba,” and many more! Your lunch includes butternut squash soup, freshly baked breads, roast boneless pork chop served with sauerkraut and Jones Original Recipe sausage, whipped Yukon Gold potatoes, corn, specially crafted cinnamon apple sauce. Featured dessert is Almond Lace Basket filled with medley of fruits, topped with whipped cream, coffee, tea and milk. Thank you for your service! 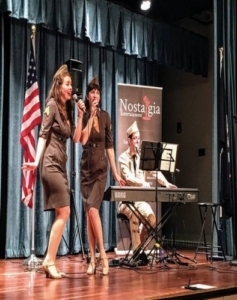 Join us on this musical tribute to World War II, featuring favorites such as “Boogie Woogie Bugle Boy,” “In the Mood,” “Bei Mir Bist Du Schon,” and “Don’t Sit Under the Apple Tree.” This musical features Andrew and his sisters in their costumed and piano-accompanied reenactment of the 1940’s. While answering musical requests from soldiers and loved ones during wartime, Patti, Maxine and Andrew entertain with Andrews Sisters-style tunes and choreography, Abbott and Costello comedy sketches, and a touching tribute to Veterans of the United Stated Armed Forces. They don’t make music like this anymore! Sure to bring back many warm-hearted memories! A wonderfully, delicious buffet lunch is included with this great afternoon. This show is already sold out. White Pines added an additional show for us. We need to hear from you as soon as possible.